For more DIY inspiration, be sure to follow Freebie Finding Mom’s DIY Teacher Gifts Pinterest board! Flower containers make great DIY teacher gifts! Say, “Happy Back to School” with these perfectly appropriate flower vases. 1. 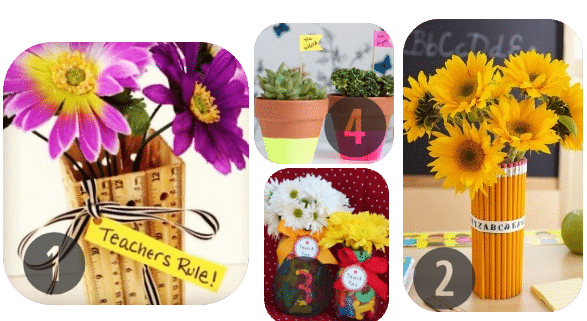 Teacher’s Rule Flower Vase: This clever DIY teacher gift is sure to put a smile on any educator’s face. 2. Flower Vase Made With #2 Pencils: Create a flower vase with #2 pencils and then finish it off with an alphabet ribbon. 3. 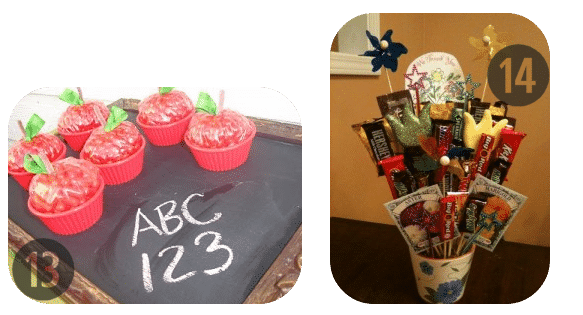 ABC Flowers: This DIY teacher gift is not only super simple but also adorably creative. Jazz up a Mason jar with inexpensive alphabet magnets then top it off with a bow and cute greeting. You can download the free printable for the greeting over here. 4. Neon Dipped Flower Pots: Transform an ordinary clay pot into a chic neon flower pot. Any plant would be happy to call this pot home. 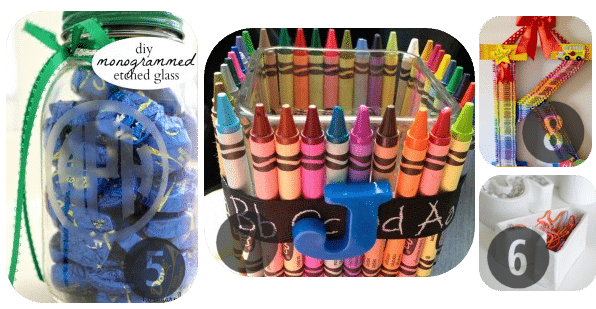 Help your child’s teacher make their classroom uniquely theirs, with these personalized DIY teacher gift ideas. 5. Monogrammed Etched Glass Jar: What an easy way to create an impressive personalized gift. This DIY teacher gift can be reused in a myriad of ways. 6. Alphabet Container: Here’s another practical and useful gift for the teacher. She can stash all kinds of little goodies in her personalized container. 7. Crayon Container: What teacher wouldn’t love a container made of crayons? This is way better than just a boring jar or mug. 8. Monogrammed Wreath: Holy creativity! Your child is sure to be teacher’s pet if you gift her this awesome monogrammed wreath! 10. Chalkboard Sign: What a fun way to welcome the kids to class! This door sign is sure to excite little learners. 11. Personalized Tote Bag: This homemade gift is perfect for a variety of occasions like Mother’s Day, a birthday gift for grandma, or a thank you to the babysitter, but it also makes a sweet personalized DIY teacher gift as well. 12. Personalized Monkey Sign: With the help of a Cricut machine, the lid from a wine crate, and paint, you can create a pretty impressive sign for a teacher’s classroom. Candy creations make great DIY teacher gift ideas. Brighten up your child’s teacher’s day with these ideas! 13. A is For Apple: This is my kind of apple, one filled with candy red hots! 14. Candy Bouquet: What’s not to love about this DIY teacher gift idea? It has three of my favorite things in a craft project: Easy, fun, and candy! 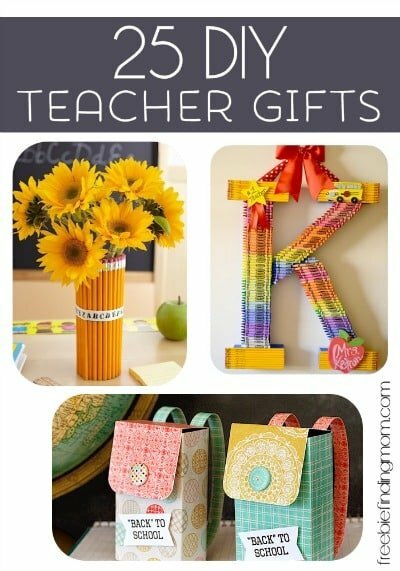 These super cute homemade DIY teacher gift ideas are sure to bring a smile to a special teacher’s day. 15. Apple Coasters: With this free printable download of an apple coaster template, you’ll be able to carve out some cute coasters in no time. 16. 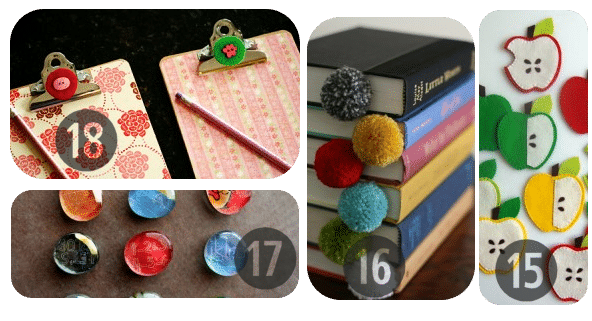 Pom Pom Bookmarks: The teacher can mark her page with this fluffy ball of cuteness. 17. Glass Magnets: What teacher can’t use some super fun magnets? Make this impressive DIY teacher gift in under an hour. 18. Cute Clipboards: Here’s a great way to spruce up a boring clipboard. Don’t be afraid to get creative with your DIY teacher gifts! 19. 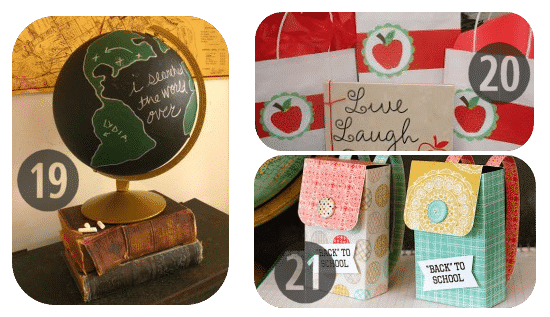 Vintage Chalkboard Globe: This idea comes from someone with real creativity! This vintage chalkboard globe is easier than it looks. 20. Live Laugh Love Tiles With Matching Gift Bags: Coordinating gift bags make these cute tiles the perfect DIY teacher gift. 21. Backpack Gift Boxes: Regardless of what’s inside, these adorable backpack gift boxes are sure to impress the teacher. After a day brightening up children’s lives, doesn’t your child’s teacher deserve to relax? 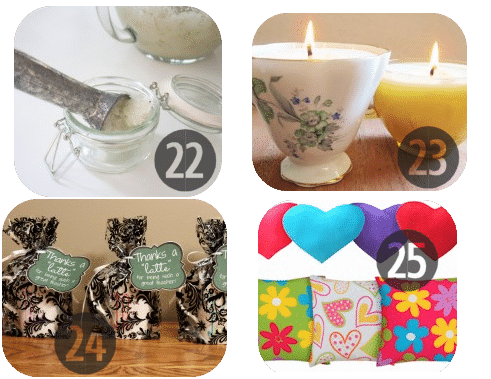 These relaxation-themed DIY teacher gift ideas will help your child’s teacher relax and rejuvenate at the end of a busy day. 22. DIY Spa Day: Save money by making your own luxurious bath products. Learn how to make Rosemary Spearmint Natural Body Scrub and download these free printable labels to finish off your gift. 23. Homemade Tea Candles: What a classy presentation for homemade soy candles. 24. Thanks a Latte: For the teacher who loves caffeine and chocolate, isn’t that everyone? Top it off with this FREE printable, “Thanks a latte for being such a great teacher” label. 25. Decorative Heating Bags: Help the teacher relieve her aches and pains in style, have your child gift her a homemade decorative heating bag.